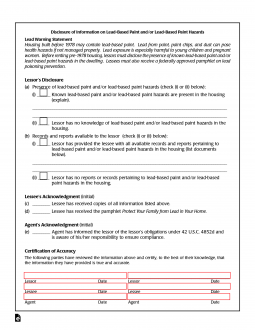 The lead-based paint disclosure form is a required form to be issued to all tenants and potential buyers for residential properties built before 1978. The paint specifically was outlawed by the U.S. Consumer Product Safety Commission at that time (16 CFR 1303) due to the hazard it poses when it chips. The forms were written to warn any new owners or tenants of the potential existence of this within the interior walls of the residence. Therefore, if an individual resides in an older home and witnesses chipping or cracking of paint, they should immediately notify the recommended local authorities. How to Know? To find out if a residential structure was built prior to 1978 the owner of the property should check with their local property assessor’s office or building department. Protect Your Family From Lead in Your Home – This pamphlet is required to provide information about lead paint to the new Buyer or Tenant. All homebuyers seeking to purchase a home that was built prior to 1978 should be given this document by the seller or their representative (agent). The one (1) page document’s purpose is for the new owner to acknowledge that it may exist on the property. All landlords that desire to rent a residential dwelling built before 1978 to an individual must attach this form to the lease agreement and have the tenant initial and sign. The United State Environmental Protection Agency (EPA) has created a guide to better help individuals, living in a structure built prior to 1978, understand the risks and what to avoid. 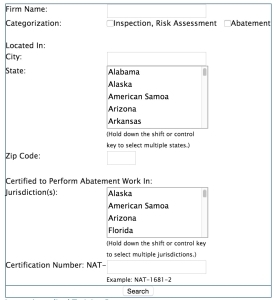 If the landlord or seller would like to have an inspection conducted on the property, they may do so by using the EPA’s Inspection, Risk Assessment, and Abatement Firms Locator.